Helping design a pool for a rehab centre – a great cause…. 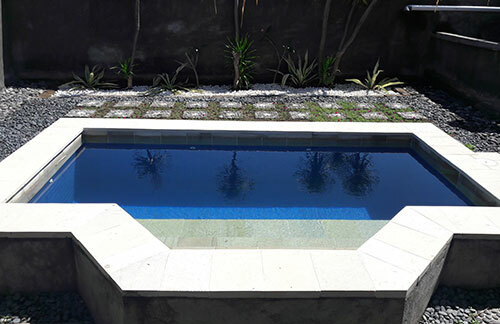 The team here at the Pool Medic were approached by Bali Beginnings, a Drug & Alcohol rehabilitation centre based in Bali to help with designing a new plunge pool for their Drug and Alcohol Detox centre. Bali Beginnings is a treatment centre helping people who suffer from problems with addiction, whether it be addiction to Alcohol, prescription medications or illicit drugs such as Heroin or Ice. Run by Howard Smith and with recovery treatment programs designed and supported by Vernon Hartshorne, an experienced addiction recovery therapist, Bali Beginnings helps people from all walks of life with finding their way back to a healthy, clean and happy life. The Bali Beginnings Rehab Centre in Kesiman in Sanur was being setup as a more affordable rehab and as such they wanted a fairly small pool, but one that was deep enough for adults to enjoy a dip in the hot Bali sun. They had a few specific requirements however including the need to have the pool raised above the ground to allow a wooden decking to be built around it, and this created the need for some special design and planning around the filtration system and plumbing to enjoy it was both sturdy and reliable and would work in with the planned decking. Aldo and The Pool Medic team advised the owners of Bali Beginnings through the planning and commissioning phase and offered guidance on design, plumbing, the earth moving works required, and choosing a filtration system suitable for their needs. The final result, well the photo speaks for itself, albeit the decking is still under contstruction – but we have no doubt that this is going to provide a nice relaxing plunge pool for people being treated for Drug and Alcohol addiction, and we couldn’t think of a better cause to get behind. Thanks for working with us Bali Beginnings, and we wish you the very best of success in helping people with addiction. Filtering the water for at least 8 hours a day in the summer season & 4 hours in the cooler season ensures the water is turned over many times, thereby removing fine particles from the water and acheiving better clarity.